All transactions are safe and secure with a reliable history in online purchasing behind each of our associates. Buy the Fear and Loathing Singapore Sling t-shirt to own Fear and Loathing clothing and merchandise. These Singapore Sling Fear and Loathing in Las Vegas t-shirts will have you reciting the opening sentence of Hunter S. Thompson's book, "We were somewhere around Barstow on the edge of the desert when the drugs began to take hold," or in this case, the Singapore Sling. This is also similar to the first line of the Terry Gilliam Fear and Loathing movie adaptation starring Johnny Depp. These Hunter S. Thompson shirts are the ideal choice for fans of the book or movie. 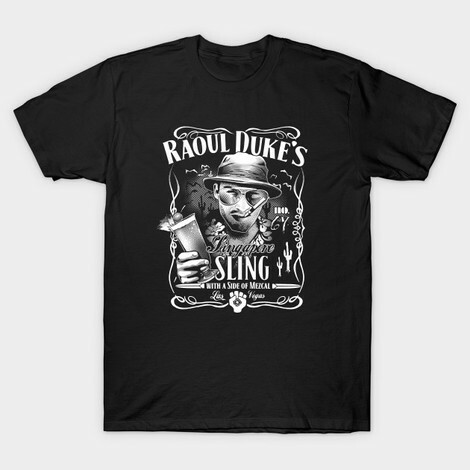 In addition to the Fear and Loathing Singapore Sling tee above, browse the Fear and Loathing Clothing Gallery for more apparel like men's and women's clothes, kids shirts or hoodies.